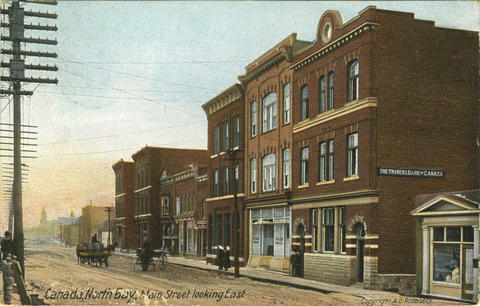 Item 008 - Canada, North Bay, Main Street looking East. Postcard is cancelled in North Bay? and in Hope Valley, R.I., Mar 16, 9AM, 1908. Message Reads: from W. N. Tanynener? Addressed to: Miss Metaea Wood, Height St, Hope Valley, R.I., U.S.A.